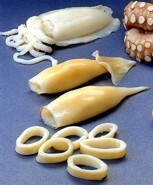 Anyone who has ever tried to skin a calamari tube by hand well knows how difficult it is. Mechanical skinning would therefore seem almost impossible. That is, however, exactly what the Omar range of squid skinning machine do. Smaller models require an operator to feed the tube over the cutting roller, whilst the Silvy model is fully automated and can be fed by conveyor belt. Of course, automatically cutting squid tubes into rings is also available. The smaller models require positioning by hand, whilst the PMT is fitted with an automatic positioner, meaning that squid tubes can be fed haphazardly.